Three two-day meetings per year are hosted in member offices and 15 educational webinars on key sales and marketing topics are conducted virtually. Annual member surveys of sales performance metrics are conducted. In addition, there are quarterly coaching and update calls. The annual Trans4mers member survey benchmarks participant performance against industry averages. Members significantly outperform the market in terms of both revenue and margin growth. Trans4mers is a Peer Group specifically for Sales VPs, Directors, and Managers in the Information Technology field. 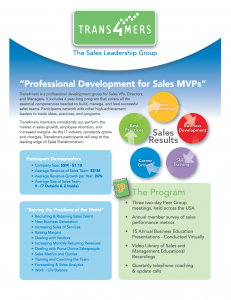 This program delivers all essential competencies to lead successful sales teams. Participants focus on hiring and on-boarding great salespeople, winning new accounts, improving margins, and managing their sales team. Successful participants emerge from our program with a proven set of processes and tools that really work! Participants meet their Solution Provider peers from non-competing markets and are able to freely trade ideas, successful programs, and best practices. Regardless of your experience level—this program will help you learn and deliver better sales results and profits.